Helicopter taking off from the USS General Duncan, an Aircraft Repair Unit. 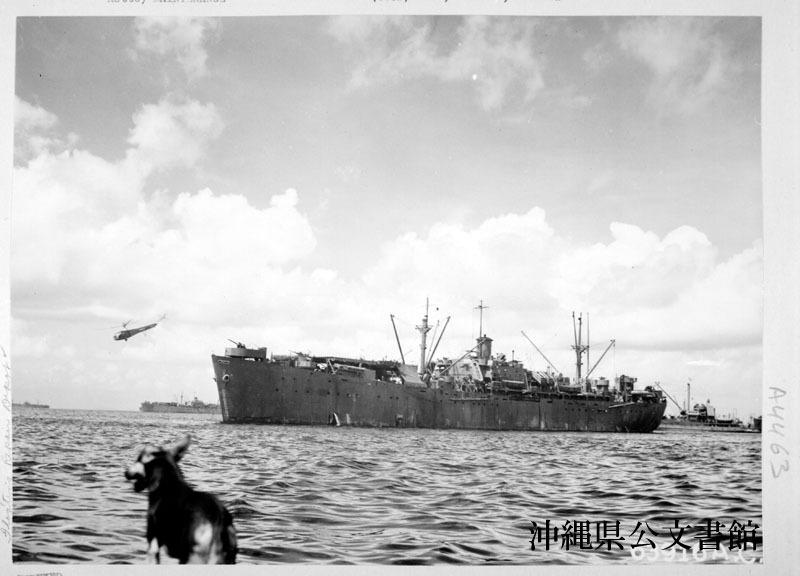 The ship was a floating air depot for repair of aircraft that moved in with our invasion forces and provided repair facilities for our aircraft until an air depot was set up on land. The aircaft repair units (floating) were equipped with at least two helicopters which provided liaison service between ship and shore. Okinawa, Ryukyu Retto. 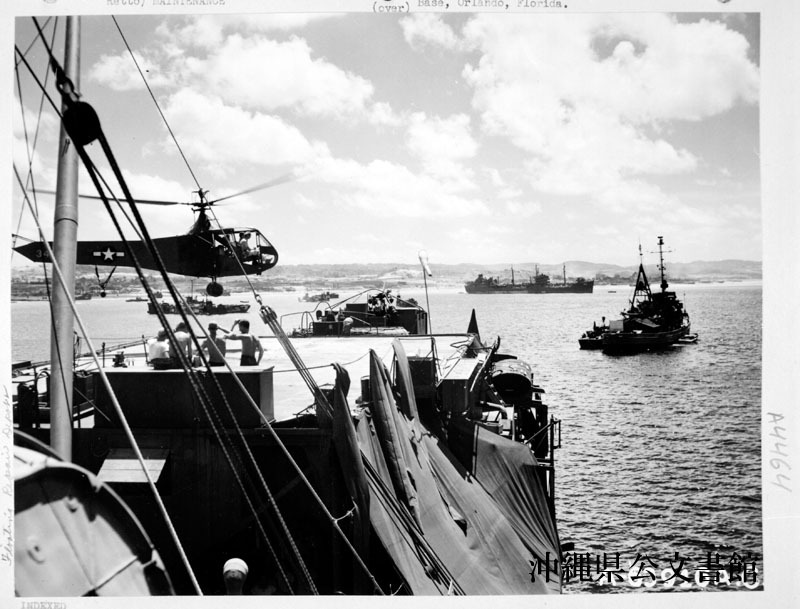 One of the two helicopters of the USS General Duncan, an Aircraft Repair Unit (floating) Liberty Ship， is landing on its flight deck after making a delivery of aircraft parts that were repaired in the machine shop of this repair ship. The helicopters were used for liaison service between ship and shore to speed maintenance repairs, and movement of Key personnel. Okinawa, Ryukyu Retto. 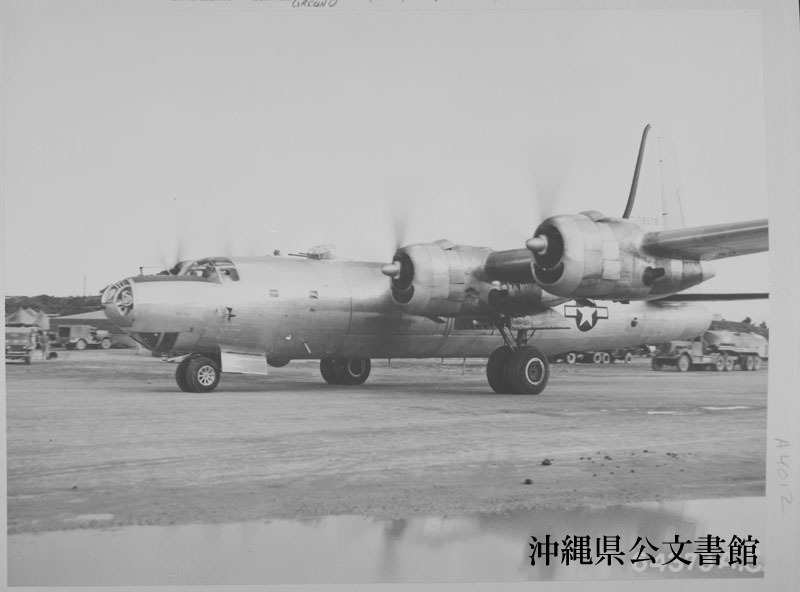 A consolidated B-32 super-bomber taxiing towards the runway on Yontan Airstrip before take-off on a routine flight to Luzon. Okinawa, Ryukyu Retto. 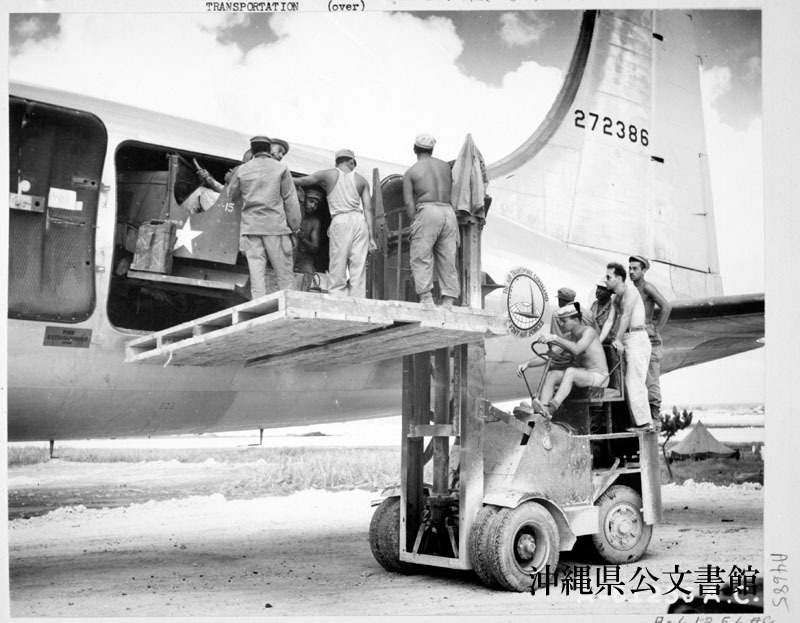 Cab section of a 6x6 truck being unloaded by a fork lift elevator from a Douglas C-54 ”Skymaster” of the Air Transport Command. Cargo plane has just arrived from Clark Field, Luzon, Philippine Islands, and will return there as soon as the cargo is unloaded. EASTER--Marine Cpl. 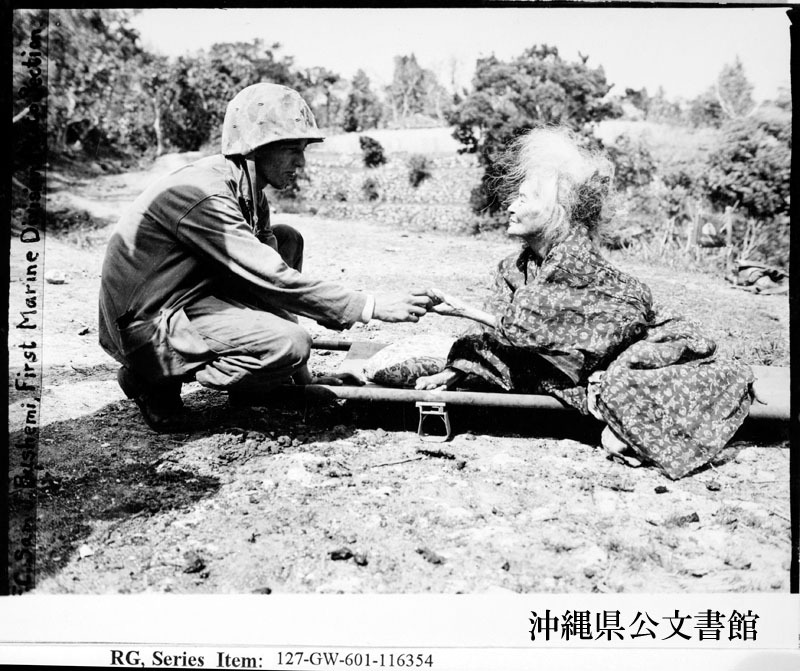 Fenwick H. Dunn, 19, of 55 Marianna St., Lynn, Mass., gives the candy from his K rations to an aged woman on Okinawa. The Japanese fled as Marines landed on Easter morning, abandoned the aged, infirm and small children. Although neither can understand the other's language, the Leatherneek's gesture and the woman's smile as she raises herself on the stretcher, say more. 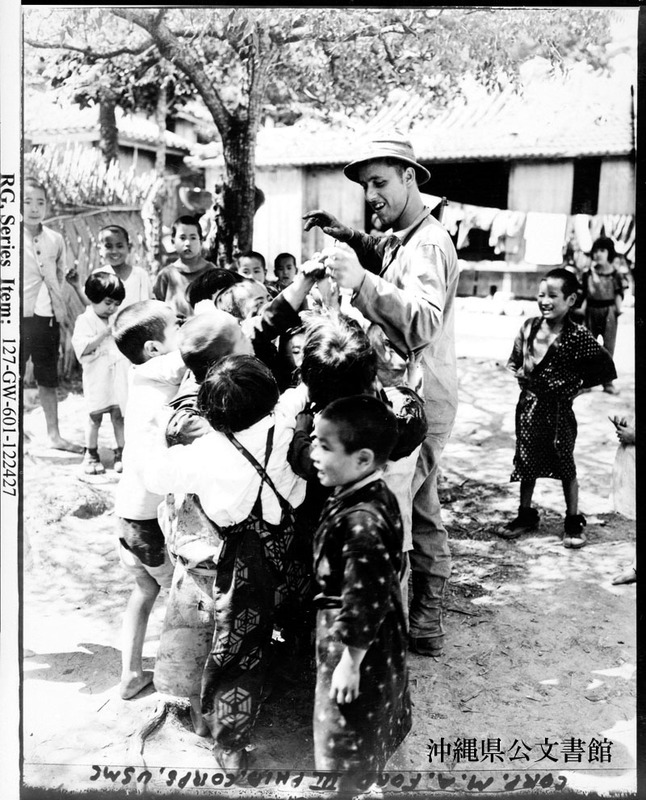 The fact that Okinawan children like candy as well as American be testified by PFC Everett E. Jenkins USMC, of Stromsberg, Neb, seen passing some out.